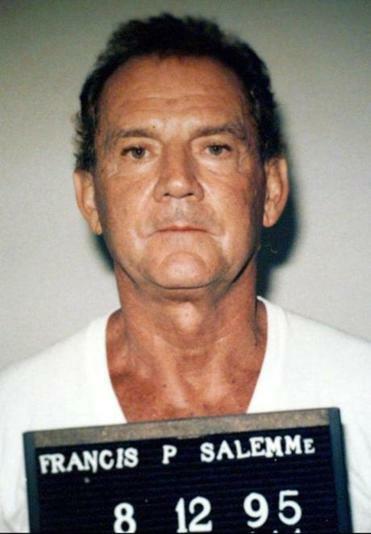 Francis P. "Cadillac Frank" Salemme. Francis “Cadillac Frank” Salemme is old now. The 84-year-old arrived at federal court in a wheelchair Wednesday for his murder trial, a case that brought jurors back to another era when the Mafia don and James “Whitey” Bulger instilled fear as Boston’s preeminent organized crime figures. On a Friday night a quarter century ago, Steven DiSarro was drunk and distraught at the Channel, a South Boston nightclub he managed, a club that Salemme and his son had a hidden interest in, Assistant US Attorney Fred Wyshak told jurors during opening statements. DiSarro had recently rebuffed an FBI agent who urged him to cooperate against the Salemmes in an ongoing investigation, and now, he told his stepbrother, he’d been summoned to a meeting with “the big guy,” code for Salemme, the boss of the New England Mafia, the prosecutor said. Three days later, on May 10, 1993, DiSarro was brought to Salemme’s Sharon home and never left alive, Wyshak said. Salemme allegedly watched as his son strangled DiSarro while another man, Paul Weadick held his legs off the ground. His body was buried behind an old mill in Providence, where it remained hidden for decades. “There can be nothing more devastating to a family than have a loved one disappear,” said Wyshak as DiSarro’s wife and children watched from the spectator section. He was a mobster who is alleged to have participated in eight murders in the 1960s. Now, two years after DiSarro’s remains were unearthed, Salemme and Weadick are charged with killing the 43-year-old father of five to prevent him from testifying against the Salemmes. Salemme’s son, Frank, died in 1995. Bulger’s former sidekick and fellow FBI informant, Stephen “The Rifleman” Flemmi, will testify that he walked in on the slaying, then hastily left. He claims Salemme later told him they killed DiSarro because “they thought he couldn’t stand up, that he was talking to the feds,” Wyshak said. But defense lawyers told jurors that the government’s key witnesses, Flemmi and former Mafia capo Robert “Bobby” DeLuca, are “accomplished liars” who have lied under oath and during interviews with federal investigators. Flemmi is serving a life sentence for 10 murders, including one former girlfriend and the daughter of another girlfriend. But he said Salemme “categorically denies” any involvement in DiSarro’s slaying. He told jurors that Salemme’s testimony helped convict Bulger’s handler, former FBI agent John J. Connolly Jr. of racketeering in 2002. Weadick’s attorney, William Crowe, described his client as a 62-year-old plumber from Burlington who had nothing to do with DiSarro’s murder and has been unfairly swept up in a case involving a “high profile” codefendant. DiSarro, who graduated from Suffolk Law School, was one of the first local developers to convert apartments to condominiums, but lost a fortune when the real estate market began crashing in the late 1980s. He owned nightclubs, then went into business with the Salemmes. DiSarro’s wife, Pamela, testified Wednesday that her husband told her shortly before his disappearance that he’d been pulled over on the highway by an FBI agent, who warned him that he was going to be indicted, possibly for bank fraud, and urged him to cooperate against the Salemmes. She said her husband “told them where to go basically,” and refused to cooperate. The last time she saw her husband was when he climbed into a red jeep outside their Westwood home on the morning he disappeared, she said. In 2003, Flemmi implicated Salemme in DiSarro’s slaying. 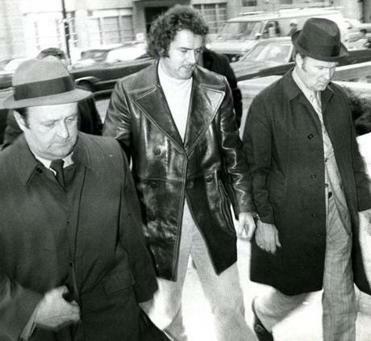 At that time, Salemme was in the witness protection program after testifying against Connolly, the former FBI agent. Salemme was convicted of lying about DiSarro’s murder, served five years in prison, then was allowed back into the witness protection program in 2009. The big break in DiSarro’s disappearance came two years ago when William Ricci, a mob associate who owned the old mill property in Providence “got himself jammed up in a drug case” and told the FBI, “there’s a body in the backyard,” Wyshak told jurors. DiSarro’s remains were recovered. Later, DeLuca admitted he helped dispose of DiSarro’s body. It’s a tangled case that has pitted former cohorts against one another. Salemme served nearly 16 years in prison for a 1968 car bombing that maimed an Everett lawyer. After his release in 1988, he was rising through the Mafia ranks when a renegade faction shot him several times outside a Saugus pancake house in 1989. In 1995, Salemme was indicted with Bulger, Flemmi, DeLuca, and John Martorano in a sweeping federal racketeering indictment. While Bulger was on the run, Flemmi revealed that he and Bulger were longtime FBI informants, and claimed they had immunity in an unsuccessful bid to get the case dismissed. Salemme, whose friendship with Flemmi dated to the 1960s, considered it a huge betrayal; he then cut a deal with the government to cooperate against Bulger, Flemmi, and corrupt FBI agents. However, even though Salemme admitted participating in eight gangland murders in the 1960s, he never cooperated in any murders that occurred during his reign as Mafia don.